Links to bee resources aimed at helping bees. Bee resources found on this page are aimed at helping you learn more about bees and what you can do to help them. The select list of resources included here have been carefully selected, and include only those with a national and global perspective. We hope you find this list of bee resources useful. Focused on education and legislative activity. Conducts yearly conventions for professional beekeepers and others associated with the beekeeping industry. A non-profit educational beekeeping organization, focused primarily on the needs of beekeepers in western North America. Emphasis is on smaller beekeeping operations. Produces quarterly newsletters and conducts a yearly conference. An international, non-profit educational organization founded in 1955 for the promotion of bee culture and beekeeper education. Provides certification of Master Beekeepers. 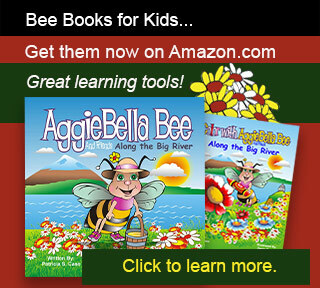 Promotes excellence in bee research. The largest non-commercial beekeeping organization in the United States and one of the largest in the world. A magazine featuring news and practical information for both hobby and commercial beekeepers. Also targets bee supply dealers, queen breeders, package-bee shippers, honey packers and entomologists. Provides an online beekeeping forum where a range of beekeepers of varying levels of experience, can share information about beekeeping. A collaboration of efforts across the country aimed at better understanding what’s causing, and how to prevent, honey bee declines in the U.S.
Partnership consists of a collaboration with leading research labs and universities related to the fields of agriculture and science. Includes relationships with a wide range of disciplines including honey bee science, economics, statistics and medical research. Supported by the U.S. Department of Agriculture and the National Institute of Food and Agriculture. A coalition made up of almost 40 organizations and agencies from across food, agriculture, government, and conservation arenas. The goal is to reverse the recent declines in honey bee health, and to ensure the long-term health of honey bees and other pollinators. A non-profit organization dedicated exclusively to the protection and promotion of pollinators and their ecosystems. The largest organization of its type in the world. The goal is to promote the health of pollinators which are critical to food and ecosystems, through conservation, education and research. Provides support to beekeepers and pollinators by ensuring the enforcement of pesticide laws and regulations, and by providing guidance and tools to defend pollinators. Raises awareness about potential adverse impact of pesticides on pollinators important to the supply of food. PAN is one of five regional centers in the world which works to challenge the global proliferation of pesticides. Defend basic rights to health and environmental quality. Ensure the transition to a just and viable food system. An international, science-based conservation organization that protects wildlife through the conservation of invertebrates and their habitats. Reducing harm to invertebrates from pesticide use.